Check out the October savings on Dryshod Footwear at H&S Feed & Country Store. Stop in and see our selection of this new line of boots we now offer. Best of all, take $10 off a new pair of Dryshod rubber boots, through October 31, 2018. Dryshod makes an entire line of rubber boots that not only keep your feet clean and dry but also offer dramatically improved support, stability, and comfort. With Dryshod, you get utility with wearability. 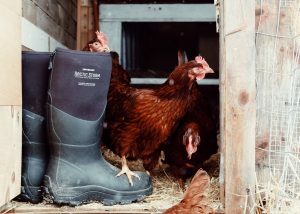 Dryshod is the world’s most wearable rubber boot! See our selection of Dryshod boots here. Have questions, give us a call or stop by the store, we are happy to help. This entry was posted on Thursday, October 4th, 2018 at 11:46 am	and is filed under Events, News & Updates, Specials. You can follow any responses to this entry through the RSS 2.0 feed. Both comments and pings are currently closed.